Last Tuesday I was working in the east of London, in Aldgate. After work, I still had 2 and 1/2 hours to kill before my train so, as it was a pleasant afternoon, I decided to have a wander around Spitalfields, a short walk away. In the 17th and 18th century the area was associated with silk weaving after Huguenots fleeing from persecution in France settled here and brought their skills with them. Later, Irish linen workers settled here. In the Victorian period, following the decline of the silk and linen industries it became something of a notorious slum. There were further waves of Jewish and then Bangladeshi immigrants bringing new cultures and energy to the area. Today, like much of the East End it’s become somewhat gentrified. The old Victorian market and surrounding streets being redeveloped. It’s an interesting place to walk around, with some historic buildings and modern street art to look at. one of the six, eccentric English Baroque churches for which he is best known. There’s an interesting war memorial in the church yard. Close by, on Commercial Street, the Fruit and Wool exchange building has been controversially redeveloped against local opposition, over-ruled by the former Mayor of London and current “Clown Secretary”. 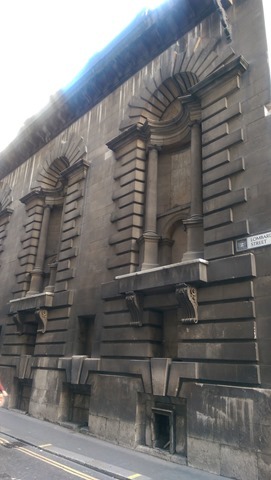 The white neo-Classical façade has, fortunately, been preserved. There’s street art dotted around the redeveloped market. Here’s a selection I spotted. Wooden Boat with Seven People by Kalliopi Lemos, features an authentic boat that was used to transport refugees from Turkey to the shores of the Greek islands. The installation aims to reflect Spitalfields’ rich history of providing shelter for successive waves of migrants across the centuries. During our visit to the Courtauld Gallery the week before Christmas, two paintings particularly caught my attention. They were of a couple of my favourite buildings in north London. 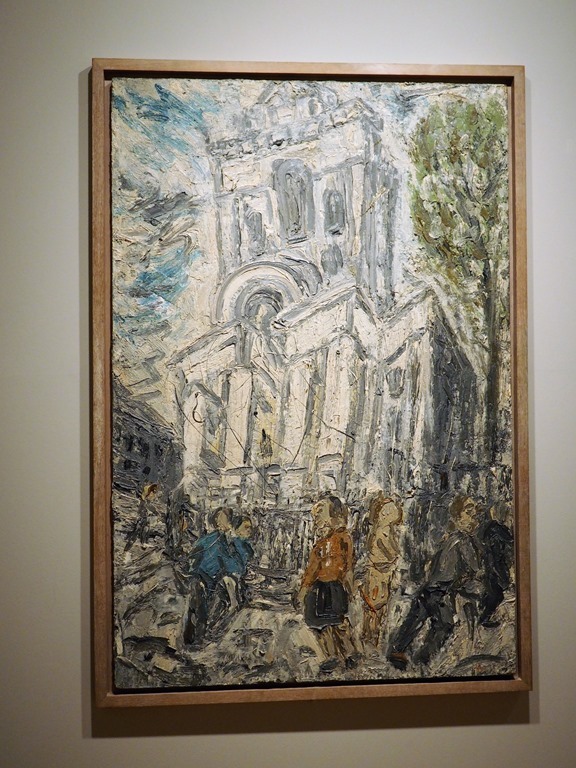 The first was this painting of Hawksmoor’s Christ Church in Spitalfields by Leon Kossoff. It’s one of several paintings he created during the 1980’s and 90’s of this beautiful white church designed by the eccentric English Baroque architect. 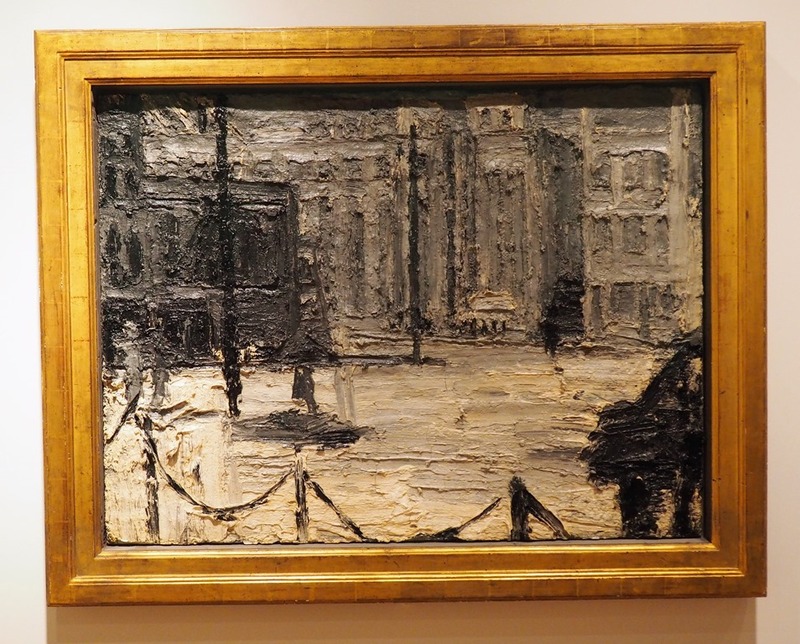 It’s painted in his characteristic style, like that of his friend Frank Auerbach, with the paint applied very thickly and in a way so that the form of the building and details of the picture can only really be appreciated by standing back. London is where Kossoff, the son of a Ukrainian immigrant, was born, grew up and worked in the capital, and scenes from the city are one of the main the main themes in his work. My first meeting during my visit to London last Wednesday was in Finsbury Square in South Islington, just outside the northern boundary of the City of London. I was done by 5 o’clock and needed to make my way over to St Pancras for a meeting at 6:30 so had a little time to spare as it’s only a short hop on the tube. So I decided to take a slightly longer route back to Old Street tube station via the Barbican and then along Whitecross Street as I’d never been in that part of London before. Walking up Whitecross Street the view along the road was dominated by an unusual church spire. “There’s only one architect who could have designed that” I thought. “Nicholas Hawksmoor”. I was right. 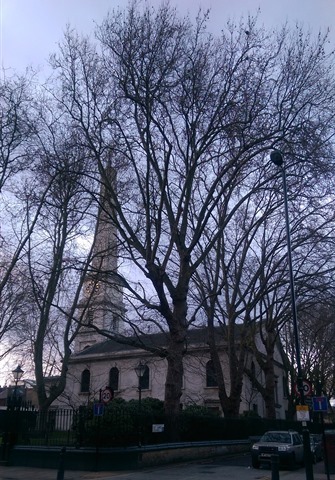 The church in question was Saint Luke’s Old Street. It was designed by John James, but Hawksmoor was responsible for the spire, the west tower and the flanking staircase wings. 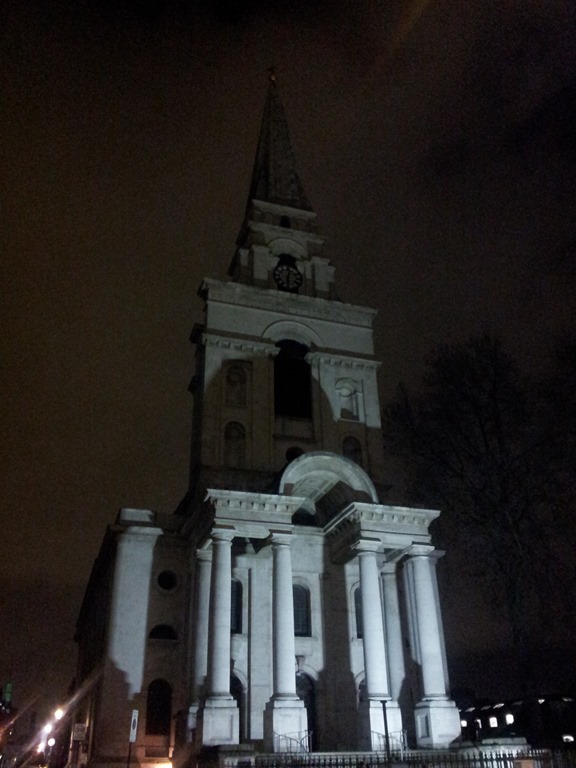 So now I can say I’ve seen all 6 1/2 of Hawksmoor’s London churches! The spire is particularly distinctive, a fluted obelisk. Probably unique for an Anglican church, but that’s Hawksmoor for you! There’s a nice sketch of the spire here. The church was consecrated in 1733, but suffered from subsidence due to being built on marshy ground and repairs were already being undertaken in 1734, Damaged during the London Blitz and suffering badly from subsidence the building was declared unsafe in 1959. The roof was removed and the church abandoned. 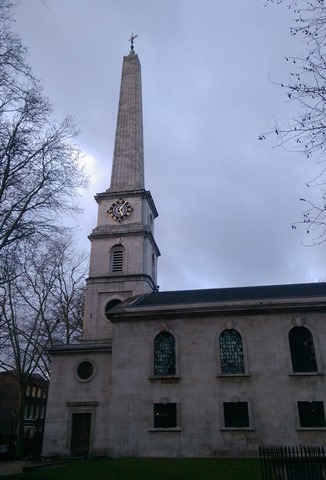 It was derelict for many years but it was restored at the beginning of the 21st Century so today the church building is a music centre operated by the London Symphony Orchestra and known as LSO St Luke’s. It is the home of the LSO’s community and music education programme, LSO Discovery. I finally managed to complete my collection of Nicholas Hawksmoor’s London churches this week. During a business trip down to the Smoke when I was staying overnight near Blackfriars, as it was a pleasant evening I went out for a stroll and ended up wandering over past St Paul’s and towards Bank Underground station. 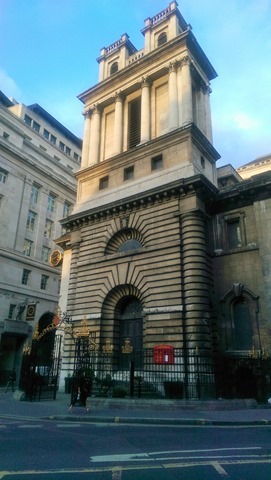 and here it was – St Mary’s Woolnoth. It’s the smallest of Hawksmoor’s churches and built in 1716-1727 on a “closed” site, which means the sides and rear are obscured. 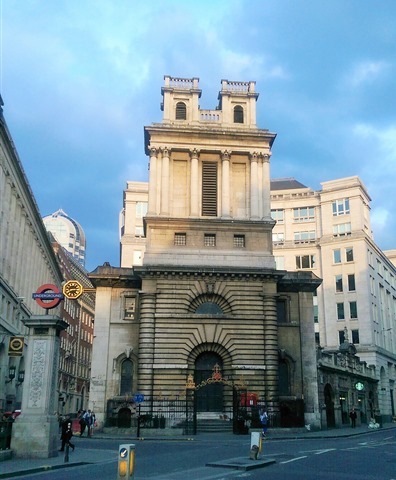 Hawksmoor used Classical features, but in an unusual way , and that’s certainly the case with St Mary’s. It’s not his prettiest building. I think it has a somewhat harsh appearance. It’s built of Portland stone but it’s rather grubby which contributes to this. So now I’ve managed to see all six of Hawksmoor’s churches. But I’ve now found out that he also designed the tower to St Luke’s on Old Street. So I guess I’ll have to go and take a look the next time I’m down there! Bank Underground station, built in 1897-8, is directly underneath the church. 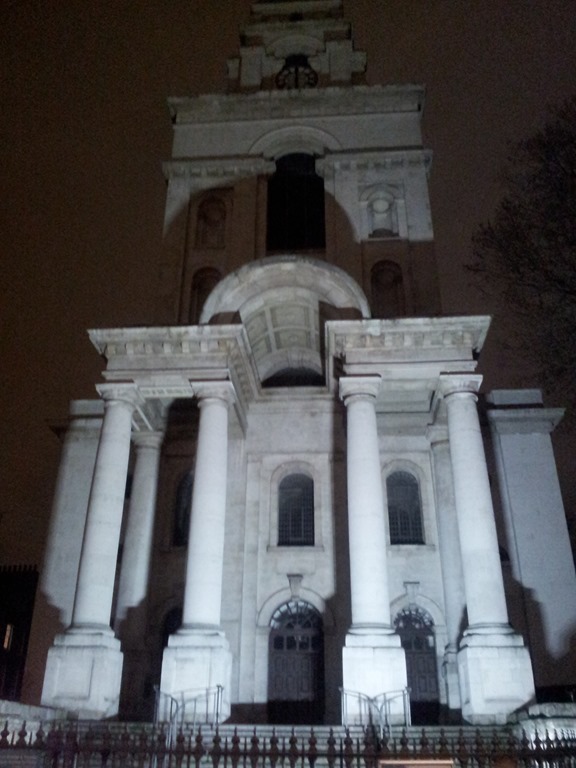 My mission to visit the Hawksmoor churches in London continues! Coming out of Aldgate East tube station before visiting the Hannah Höch at the Whitechapel Gallery I could see a church spire protruding above the roofline in the distance. 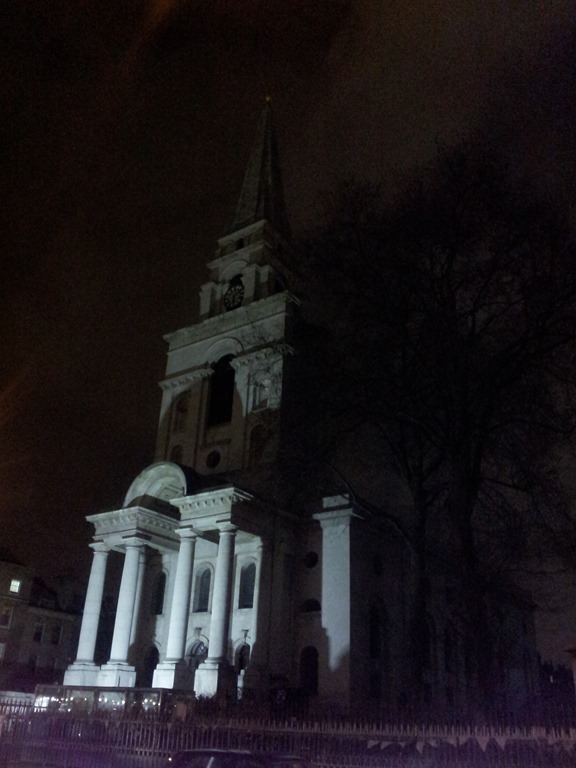 I knew that Hawksmoor’s Christ Church, Spitalfields was not far away. So after I’d finished looking round the exhibition, as I had a couple of hours to spare before my train was due to leave Euston station, I decided to walk the short distance to take a look at the church. It was dark by now, but the facade was lit up. I thought it was an impressive building. Less quirky than the other examples of his work that I’ve seen. It’s dominated, as is usually the case with Hawksmoor’s churches, by the tall tower with it’s spire., and also by the porico – eight large Tuscan columns supporting a semi-circular pediment. By the time I arrived the church was closed. I’d have like to have had a look inside. I’ll have to save that for another day. Only one more Hawksmoor church to go now. Something for my next visit to London.